Ethernet, IP/MPLS and Pseudowire Capabilities in a Compact 1RU Form Factor. For service providers, revenue growth is increasingly driven by 3G and eventually 4G mobile services that provide access to compelling smartphone and tablet-based applications. The challenge in designing true 4G mobile backhaul is to build a foundation that protects existing investments in 2G and 3G services, provides a superior subscriber experience, prepares for future 4G service requirements, and minimizes costs. This challenge can be met by deploying a true 4G mobile backhaul network with three key ingredients: resiliency, synchronization and performance. Extreme Networks E4G-200 router is a carrier-grade Ethernet platform that provides a seamless migration path from TDM circuits to Ethernet services for mobile operators and creates a fundamental Ethernet infrastructure capable of scaling to the needs of 2G, 3G and 4G mobile networks. The Extreme Networks E4G-200 Cell Site Router delivers Ethernet, IP/MPLS and pseudowire capabilities in a compact 1RU form factor. The E4G-200 provides mobile operators the ability to manage and aggregate TDM and Ethernet services and their associated protocols onto an economical and efficient Ethernet mobile backhaul infrastructure. The Extreme Networks E4G-200 Cell Site Router (CSR) is where 4G backhaul begins and where the T1/E1 pseudowire circuit for 2G/3G is also initiated. Installation is in or very near to the base station tower. 2G and 3G base stations use T1/E1 for backhaul connectivity and 4G base stations connect directly to the cell site router via Ethernet. The E4G-200 provides the necessary interfaces for 2G, 3G, and 4G base stations while still meeting the demands of its installation environment, in a design that is very compact (less than 10 inches/24 cm deep), and features an extended temperature range. The Extreme Networks E4G-200 router is designed for services running over an Ethernet and IP/MPLS infrastructure. The E4G-200 is designed to backhaul 2G, 3G and 4G mobile traffic, using a single backhaul network instead of a multiple backhaul networks which translates into an economical deployment model. Service providers, energy utilities, transportation and government agencies can deploy Extreme Networks E4G-200 router for mobile backhaul with the knowledge that their deployments will have advanced services. The E4G-200 enables service providers to provide Ethernet/IP services cost-effectively at any cell site, including optional TDM pseudowires and deployments of 4G base stations. This flexibility gives service providers the ability to deploy revenue-generating services at 2G/3G cell sites and allows for 4G deployments and new Ethernet/IP services. The 1RU size of the E4G-200 allows economical installation in cell site locations where space is limited. All Extreme Networks advanced routing and switching features, including IPv6, are available on this compact and powerful platform. E4G-200 optionally supports up to 16 ports for circuit emulations via industry-standard pseudowires, allowing the transformation of TDM cell sites to Ethernet/IP/MPLS cell sites. With an extended temperature range of -40°C to +65°C, service providers can deploy the E4G-200 router at sites without climate control, enabling more sites to convert to packet-based backhaul, reducing CapEx and OpEx, and allowing Ethernet/IP services to be delivered to a larger target market. Twelve active GbE ports allow service providers to connect more 4G base stations for growth and to support other Ethernet/IP equipment local to the cell site. Mobile backhaul networks require accurate timing. The E4G-200 provides today's existing TDM timing on it T1/E1 ports as well as the Ethernet-based timing—both IEEE 1588v2 and SyncE—on its Ethernet ports. Extreme Networks supports EAPS as well as the G.8032 Ethernet Ring Protection standard. Support for IEEE 802.3ah, IEEE 802.1ag, and ITU Y.1731 gives management and reporting control over the Ethernet backhaul, including pseudowires to provide integrated Ethernet OAM. Functions in the hardware allow for mere microseconds of latency to improve performance of latency-sensitive applications that are a part of LTE rollouts. Ports, services and OAM functions run at line rate with no degradation in service when the different feature sets are enabled. 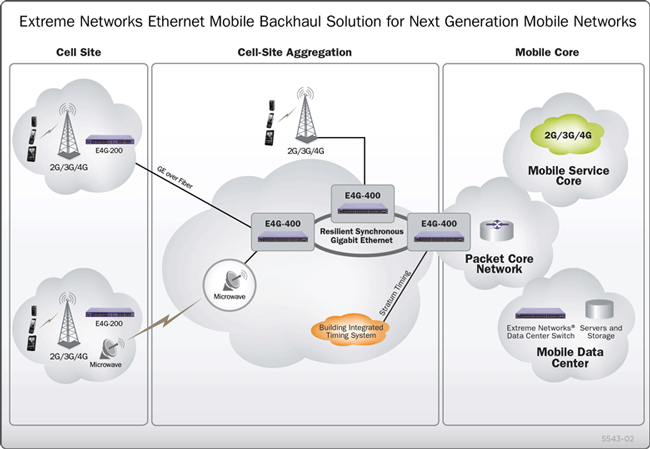 Extreme Networks Ethernet mobile backhaul solutions are geared towards the unique demands of mobile operators. Our solutions offer support for multiple generations of services. Mobile operators can lower their capital expenses (CapEx) and operational expenses (OpEx) by reducing the number of network elements and simplifying operations. Our solutions can enable mobile operators to deliver a network that is geared towards the new mobile world, providing access, awareness and control, from the cloud to the converged edge. The E4G-200 enables service providers to provide Ethernet/IP services cost-effectively at any cell site, including TDM pseudowires and deployments of 4G base stations. This flexibility gives service providers the ability to deploy revenue-generating services at 2G/3G cell sites and allows for 4G deployments and new Ethernet/IP services that will be defined in the future.